After attending the 125th Reenactment of the Battle of Gettysburg in 1988, Bruce became a Civil War reenactor. Each year thousands of people gather to relive that time in history as well as others carrying old weapons, acting out battles, and wearing reproduction period clothing, such as the 100 percent wool uniform that reenactors like Bruce wear in the middle of July. Bruce portrayed a private in the 28th Massachusetts Co. B, a regiment of the famed Irish Brigade. Over the years he has participated in numerous battle reenactments, as well as festivals and school programs. His experiences have given him a much better understanding of what it might have been like to have been a soldier during the Civil War, whether it meant engaging in hand to hand combat or getting by on meager rations. 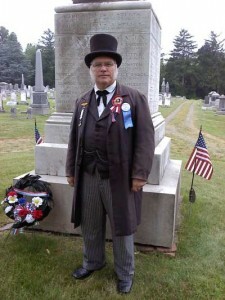 Bruce moved from reenacting the character of a front line soldier to portraying Charles Smith Olden, governor of New Jersey from 1860 1853,during the first years of the Civil War. A former state senator and treasurer of what was then the College of New Jersey (Princeton University today), Olden may be best known for constructing the magnificent mansion called “Drumthwacke,” which is now the official residence of all New Jersey governors. New Jersey did not have any Civil War battles on its soil, but it contributed a great deal in terms of not only martial manpower, but also civilian support to the Union’s fight in the War Between the States. Bruce Sirak firmly believes that New Jersey’s citizens should be extremely proud of their State and of its veterans who served valiantly to support the Union cause in the Civil War era.